Whether you need to touch up your room, buy cute stationery for work motivation, or simply pick up a coin purse that resembles a summer fruit, Vardaan Market is your next stop for all things kawaii (the cuteness phenomenon originating in Japan that has taken over the globe). Been eyeing those fun-shaped glasses at a local bar? Get them here. 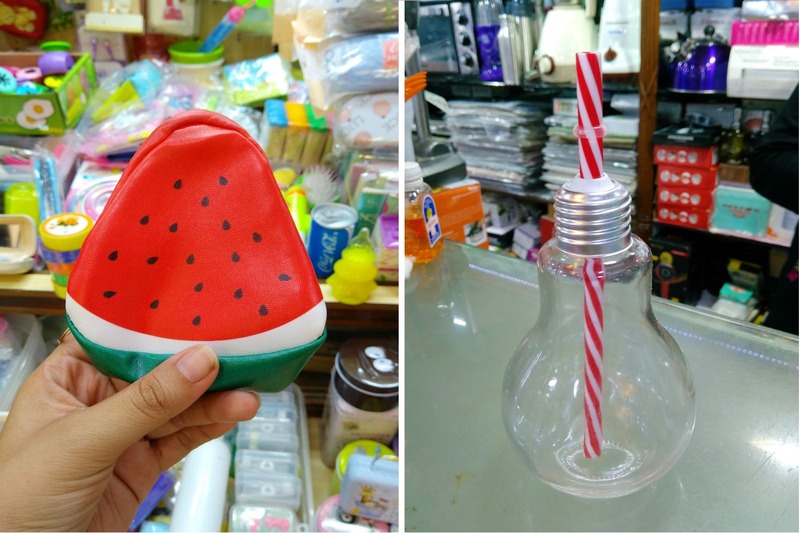 For INR 70-200 a piece, there’s a whole collection of mason jars, bulb-shaped sippers and vintage milk bottles on the first floor kitchen appliance stores. Now, you don’t have to step out for a fancy drink. If organising isn’t your forte and you’re constantly in a state of lost and not found, use these mini multipurpose containers to store away jewellery, medicine or paperclips. Priced at INR 50 for 3, the cute prints will help you keep them in sight! Also, why leave out your bathroom while decorating? Here’s a cute cow tooth-brush holder for INR 80! A pending assignment, an unwritten letter or simply a stationery nerd? Vardaan offers a plethora of items to suit your every need ranging from bright paper cutters (INR 70-200), packs of highlighters, stickers, decorative envelopes, and more! We picked up a small, metal pail in red (INR 200), it adds some colour to the desk and serves as a pen stand. We found pouches everywhere and of every kind to store your change in style. A luggage-shaped rubber pouch in hot pink, complete with mini wheels and a zipper; a slice of fruit, maybe? There was watermelon, kiwi and orange, and simple powder blue-and-white stripes pouches coupled with a happy quote. Take your pick! Grab new clothing for your phone or choose Sponge-Bob earphones at the mobile stores on the ground floor. Any other gear you need? They’ll have that too. Just browse around a bit. Vardaan is officially kawaii land! Go get these understated accessories with subtle and functional designs right now!